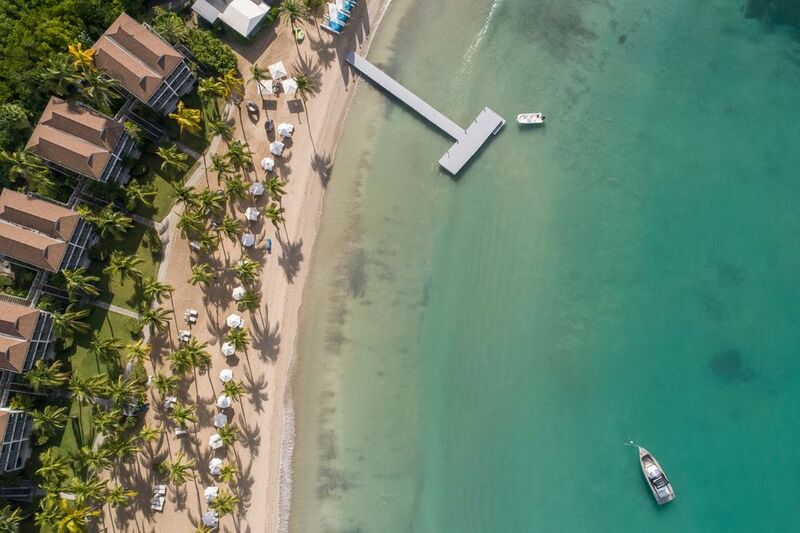 Sleek, smart, understated glamour is the name of the game at Carlisle Bay, the perennially popular boutique hotel nestled in a quiet inlet on the south coast of Antigua. A long-term favourite with discerning Brits and Europeans for its easy flight time (eight hours on-board and five hours behind means you arrive just in time for lunch), this discreet destination has all the glamour without any flash – you won’t spot a single paparazzo hovering in the bay, despite the endless roster of A-listers who come to laze on the beach unseen. 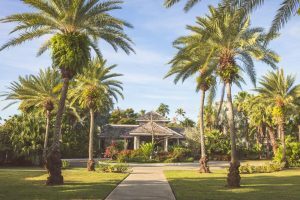 Each guest here experiences VIP treatment in true island style, from the fast-track pass through customs at the airport to the tailored nature of the quintessentially Caribbean service. 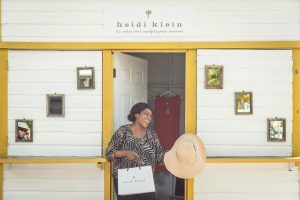 All the more reason, then, for Heidi Klein – the British-based brand beloved by Kate Moss, Gisele and Gwyneth, to name a few – to have found its perfect outpost in this beachy haven, with a boutique overflowing with flattering swim styles and classic coverups. Little ones aren’t left out either; kaftans, rash vests and playsuits are on offer for kids, while the super smart and wildlife-friendly Love Brand & Co. have a next-door shop packed with men’s trunks, shorts and shirts, plus mini-me versions for boys, too. With just 82 rooms and suites, you could be forgiven for thinking that Carlisle Bay is a one-size-fits-all style place, but its beauty lies in how expertly arranged it is; all rooms face the beachfront, some with terraces and some with gardens, and families and those with smaller guests in tow are nestled at one end of the bay, while the other half (handily next to the sleek adults-only Jetty Bar & Grill) is home to those looking for a more grown-up getaway, ensuring every guest gets just what they’re looking for. Everyone is spoilt for choice with the resort’s range of restaurants; from all-day dining at Indigo on The Beach, a casual daytime affair that turns into a dressy evening hotspot; to East, with its elegant oriental cuisine; or Ottimo, ever-popular with families for its relaxed poolside setting and menu stacked with wood-fired pizzas, pastas and other Italian favourites. 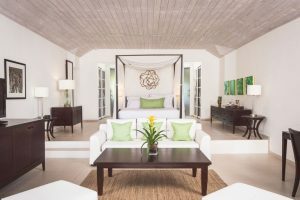 Bedrooms are elegantly decked out in classic island-style décor, with ceiling fans gently whirring and AC set to moderate the temperature with utter precision. Giant four-posters with mosquito nets are designed to create a smart silhouette, while luxe matching sofa sets are finished with bright cushions to add pops of colour to the smartly decorated rooms. While guests with families or larger parties can opt for two or three-bedroom suites – one with an enormous wrap-around balcony – each are equal in amenities, including gigantic sunken bathtubs to soak in after a long day on the beach, and his and hers sinks under an oversized vanity mirror in the outrageously spacious bathrooms. Families find it the perfect match with its excellent kids clubs and activities suited to everyone – from boat excursions to nearby Nelson’s Dockyard, the picturesque UNESCO heritage site that still functions as the island’s popular harbour with hints of piratical adventure, to snorkelling, paddle boarding and the excellent tennis facilities on offer. Private instructors take group or individual lessons to polish your game, while the less actively-inclined can relax in the adjacent spa, complete with saunas, plunge pools and a range of treatments including the brilliant West Indies Massage – an instant cure-all for any post-plane aches and pains. 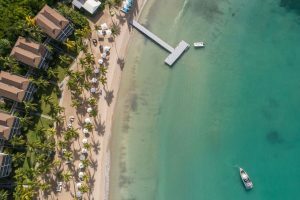 The only negative we could find about Carlisle Bay? Getting on the plane to leave – but with its relatively short and sweet flight time, you know paradise is never too far away. 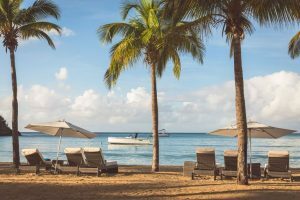 Classic Collection Holidays offers seven nights at Carlisle Bay, St Mary, Antigua from £3039 per person between April and December, and from £4099 per person between January and April. 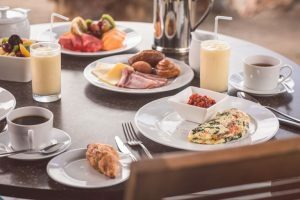 Prices based on 2 adults sharing a garden view suite on a bed & breakfast basis, and includes return flights from London Gatwick, private transfers, UK airport lounges and fast track through customs on arrival in Antigua.